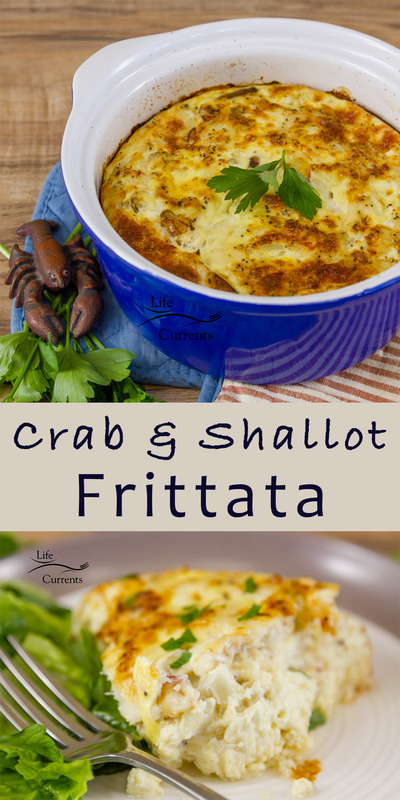 Frittata, crustless quiche, egg casserole, whatever you call it, it’s delicious, and a great way to enjoy crab meat! Eat this Crab and Shallot Frittata for breakfast, brunch, lunch, or dinner. And, it can be enjoyed hot from the oven, room temperature, or cold from the fridge. Super flexible and easy to enjoy any way you like! I’ve gotten lots of wonderful crab this summer. I love the salty simply goodness that crab meat is. I made this one in a deep casserole dish. If you choose to do the same, it takes a little longer to bake so that it’s set in the middle. A shallow pie plate works great to keep the cooking time down. Preheat oven to 425°F with rack in middle. Butter 10-inch glass pie plate or round casserole dish, then sprinkle the pan with bread crumbs. Heat a small saucepan over medium-high heat, and add the oil. Cook shallots until softened, about 5 minutes. Spread in dish, then evenly sprinkle cheese on top. In a separate bowl, whisk together eggs, milk, crab, and pepper, and pour over cheese. Bake until top is golden and custard is set in center, 20 to 25 minutes for a shallow pan, and 30-40 minutes for a deep pan. Allow baked frittata to cool 10 minutes before serving. Cut into wedges to serve. Enjoy! Can be served hot, at room temperature, or cold from the fridge.